Best Brie Sandwich – I shall call you Yum and love you forever. Who doesn’t love a grilled cheese sandwich? If you don’t you should leave now and forget you ever saw this place. I love the gooey melty cheese and the most satisfying crunch of the warm toasty bread. I usually make grilled cheese on the panini press because it works by heating and toasting the bread from the top and bottom at the same time. The only downfall of this is that if you are using a fluffy bread like Brioche then the weight of the press counteracts that fluffiness. Another thing I do when making grilled cheese is I melt the butter and apply it with a pastry brush. I think this allows you better control over the amount of butter you apply. Typically you don’t need much to give you that buttery crunchy outside. You can also add things to the butter like garlic or tarragon or other delicious additions. I wasn’t in the mood to present the boys with Brie today so I made them a simple sharp cheddar and green apple grilled cheese and they LOVED it. It is really easy to adapt sandwiches to suit all the members of your families personal tastes. All hail the sandwich. Lets get to this sandwich called YUM. What you’ll need: melter butter, Sourdough: the king of breads. 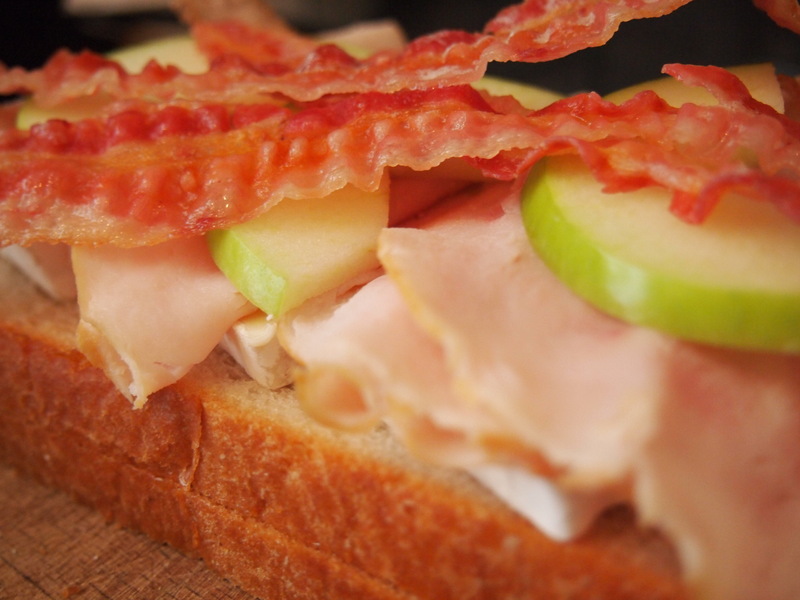 Creamy Brie cheese, sliced Granny Smith apples, turkey and a little bacon. Please pre-cook the bacon; don’t expect the bacon to cook in the middle of your sandwich. First things first, give yourself 3 good sized slices of Brie and slice your apples about 1/8 inch thick. Next you will want to either turn on your panini press and set to medium or preheat your pan. Lightly, really, lightly butter both pieces of bread on one side. 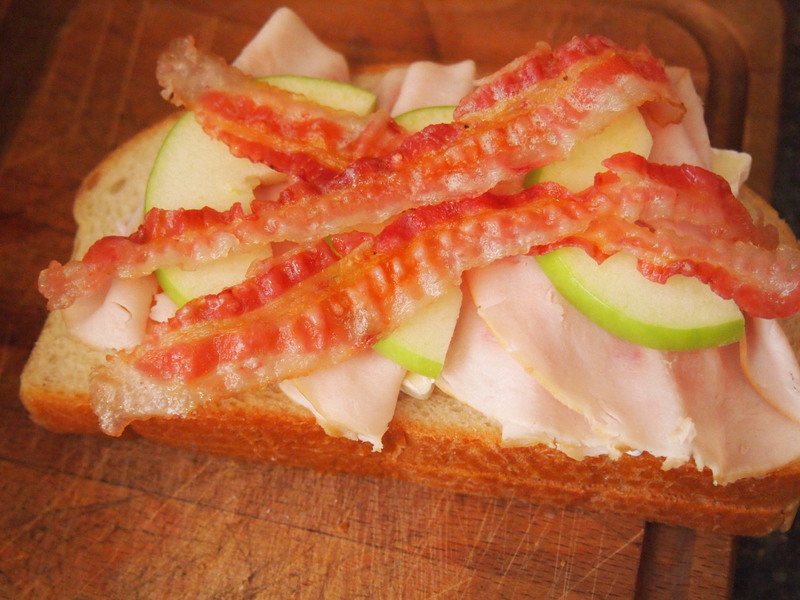 Place on slice of bread in the pan or on the press, followed by the Brie, the apple slices, the bacon and finally the shaved turkey and second slice of bread. If you are using a panini press close the lid and let it go for 4-5 minutes until the bread is golden amber brown and the Brie is just oozing out the side of the sandwich. If you have chosen to use a pan, then proceed as usual for creating a grilled cheese.